Originally from Belgium, and mother of one, Martine Rahier holds an Engineering degree in Agronomy from the Free University of Brussels (1977). She continued her studies in the USA at the Universities of Cornell and Berkeley, and obtained a PhD in Science from the University of Basel in 1983, and “Habilitation” in Ecology from the University of Zurich in 1993. Granted a professorship by the Swiss National Science Foundation in 1988, she became a Professor of Entomology and Animal Ecology at the University of Neuchâtel in 1994. In 2001, she founded the “Plant Survival” National Centre of Competence in Research (NCCR), a network comprising more than 200 people. In 2008, she was elected rector of the University of Neuchâtel ending in August 2016. Martine Rahier has been a member of several national and international university committees, from appointment commissions to committees designing study programmes in various universities; she has also been president and member of committees assessing research programmes and projects, as well as of scientific associations. Author of numerous publications, she has also supervised a large number of doctoral theses. 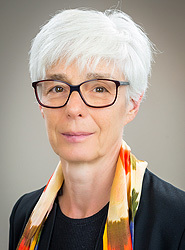 Martine Rahier was a member of the Rectors’ Conference of Swiss Universities (2008-2016) and president (2013-2015) of the “swissuniversities”.She is member of the German accreditation council since 2013, vice-president of European University Association since 2015, member of the council of the Agency for Quality Assurance and Accreditation Austria since 2017, and board member of WWF Switzerland since 2017.